As I was working on cleaning up the kitchen last week, I was thinking about the fact I was getting low on dishwasher detergent and needed to find some good deals. I just haven’t seen or heard of any recently. In addition, I’ve become very interested in using healthy products in the home such as Shaklee Basic H2. 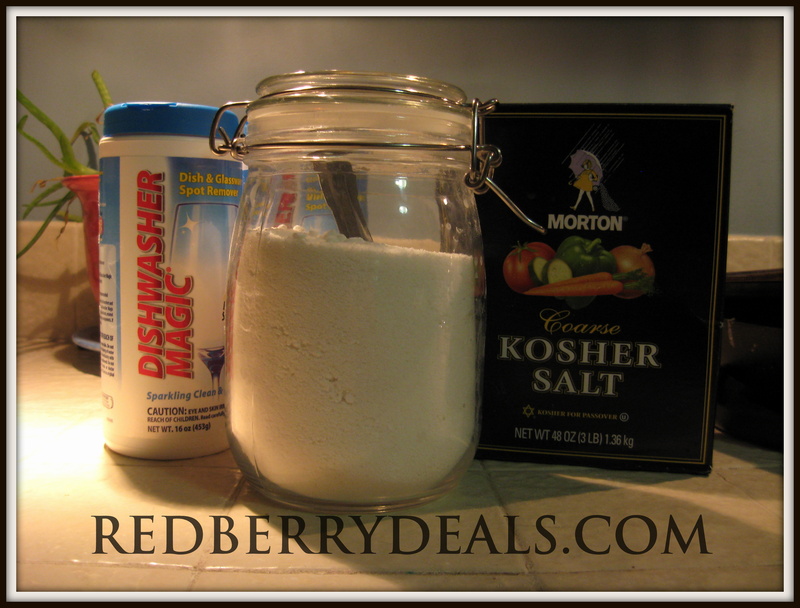 I did some simple searches and found several websites offering their recipes for Homemade Dishwasher Detergent including DIYnatural.com . This got me very excited because I have most of the ingredients at home! Not only would this be healthy but also cheap! Now the question was would this really work??? Use 1 Tbsp per load (you can use a heaping tablespoon if you feel the need, but we do not). Each batch yields 24 ounces of detergent. We recommend storing in a container you were going to dispose of anyway, like an old yogurt container or coffee can you can fit it under your kitchen sink. Feel free to double the batch, or multiply to create any amount you’d like. I needed to find Citric Acid. Where do you find Citric Acid? There were suggestions the FAQ on their site such as Amazon, and Lemi-Shine , and most stores sell canning products with Citric Acid. I headed to my local Walmart and compared the prices and what I could tell by the labels and found Dishwasher Magic Dish and Spot Remover. It said its main ingredient is Citric Acid so I went ahead and purchased 16 oz for $3.50. Note: I only need 1/2 a cup for this recipe. I came home and followed the instructions above and as you see in the picture came up with a container. One of the suggestions is to continue to mix it by shaking it so that there are less clumps. Clumping is a problem with this mixture especially for high humidity climates. I did just as mentioned and so far so good. Then I read, there are some people using the Silica-Gel packets that you get in medicines and other products to absorb moisture and add them in. So whenever I find one I throw that in for safe keeping. Then using it! I put a tablespoon in the bottom of the dishwasher and then another half-tablespoon in one of the cups. I also have solid Jet Dry that I use since our dishwasher is more than 20 years old it doesn’t have the fancy Jet Dry dispenser. It turns out the dishes have been coming out very clean. I’m so impressed! I can’t seem to get them to come clean like that with any of the name brand detergents. I know we have hard water but this recipe works great and with the solid Jet Dry it really works. I love my old dishwasher! I wanted to update this post and say that I’ve been so happy with this recipe and even my skeptical husband really is impressed. We use 1 tablespoon in the bottom of the machine and a little less than a tablespoon in the cup that closes. The dishes come out perfect. I have recently purchased the Citric Acid from Amazon and it works just as good as the Dishwasher magic. Our environment is pretty humid in the woods which causes it to clump up a bit. I put several of the moisture packets (silica gel) into the mixture so that it doesn’t clump as much and I gently shake or stir it regularly. I find this batch lasts us about 3 weeks and we do at least 1 to 2 loads a day.